Just had another Signature Album delivered. So beautiful! 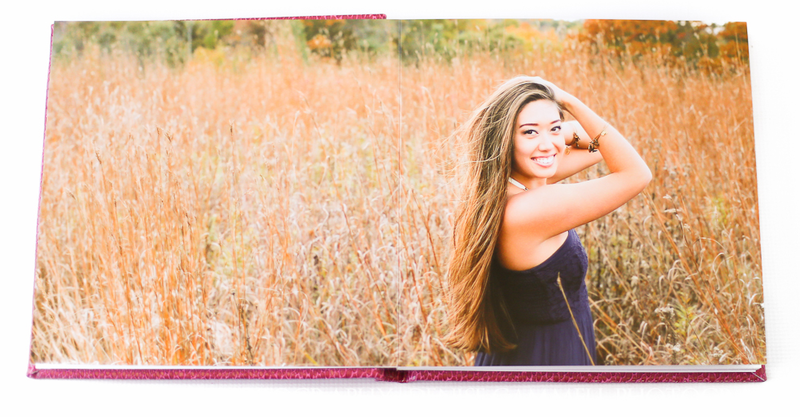 These 10"x10" lay-flat, thick album pages open up to reveal a stunning 10"x 20" spread. These are a wonderful keepsake item. They are so versatile because they can be displayed on a shelf, propped open on an easel, or as a beautiful coffee table book. When my clients cannot decide on pictures to display in the home, this is always the answer to what they are looking for. With the Signature Album, you get all your favorites! A question I get asked often is "who should we get the album for?" Usually parents want an album to keep, especially when their graduate is going off to college. There are so many stunning cover materials to choose from. One of my favorites for high school senior girls is the pink crocodile leather seen below. These images do not do this luxury product justice. I'd love to show you these albums in person. Contact me to book your session, dates fill up quickly.